So you’ve done the hard work to design, test and produce something brand new, and it’s time to launch your product. It’s important to make an impact, increase brand awareness and generate demand far and wide, so try these tips to market a new product effectively. It’s an old approach but it’s withstood the test of time for a reason. A well-organised product launch will generate interest among the media, who have the power to market your product and turn it into a success. Be organised in your event planning, because the end result will be well worth the effort. Write a comprehensive press release well ahead of time and distribute it to trade press, local media, commercial outlets and selected customers – whoever you feel will give your product the coverage it needs. 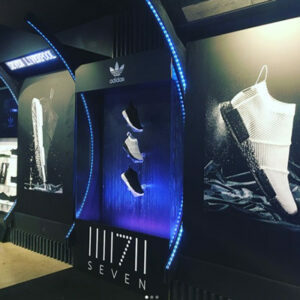 Publicise your product launch on social media and ply your guests with food, drink and entertainment, surrounded by décor that matches your brand – the more awe-inspiring the better! Entertainment Effects’ clients have used special effects, illuminations and water effects to successfully launch their products to the media in the past. The Adidas GORE-TEX trainer launch with wall of water! 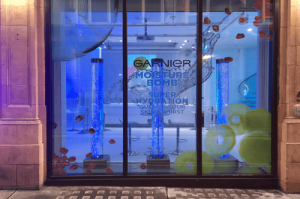 Take the launch of the Garnier Moisture Bomb Launch for example, which used bubble tubes and rain curtains to fit perfectly with their theme, promoting their day and night cream for healthy, glowing skin. Alternatively, check out the launch of the Adidas GORE-TEX trainer in the Seven Store, Liverpool. Entertainment Effects set up two display units to promote the product, including a wall of water! Don’t forget to offer freebies for them to take home – ideally they’ll enjoy your free sample and reward you with positive coverage on the radio, TV, internet and in print. These days, more and more brands have taken to guerrilla tactics to market a new product. Surprising people in their day-to-day environment, whether that’s a busy street, railway station or even a park on a summer’s day, can often grab their attention and capture their imagination more effectively than a traditional marketing campaign. Imaginative concepts executed in a larger-than-life way can be very powerful in getting across your marketing message. 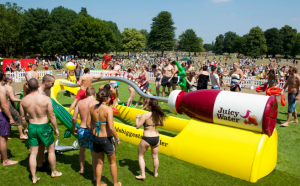 Take Innocent Drinks for example, whose guerrilla marketing campaign involved breaking a Guinness World Record with a giant custom water feature. Don’t forget to capture video footage of your marketing stunt. By promoting it on social media, you’ll reach an even wider audience – and your videos and images will also endure much longer than any temporary exhibit. Buddying up with another brand is a great way to market a new product to a sympathetic audience, if the partnership is chosen well. Pick a supermarket, TV channel or other brand that is a natural ‘fit’ with your own. Give them exclusive rights to your product, and in return, benefit from their ready-made audience and marketing budget. Giving out free samples is always a sure-fire shortcut to a customer’s heart. Products like food, drink, cosmetics and toiletries are ideal for this type of marketing; pick a location popular with your target audience and don’t forget to use branded banners, truss structures and other accessories to reinforce the product in people’s minds. If you’re selling something a little less practical for giveaways, think of other ways to let your audience get to know your product. If it’s something big like a car, hire a spot in a shopping mall and show it off there – perhaps get people to have their picture taken in the driving seat.